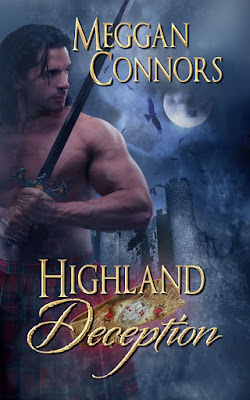 Late to the party, again, but this week we welcome Meggan Connors and her new release, Highland Deception. 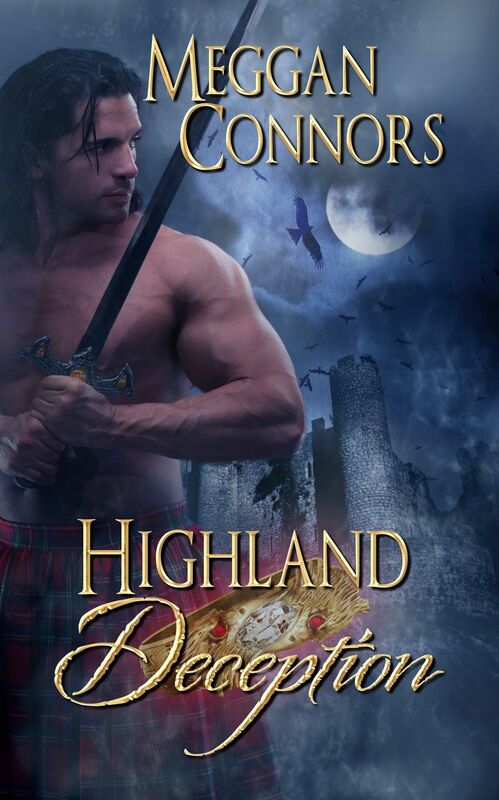 If you can make it past the gorgeous cover, there's an excerpt and Meggan's info. "Milord." She gasped for breath. Grant was suddenly at her back. "Sir, I apologize. She’s faster than you’d think." He laid a hand on her shoulder, as if to steer her from the room. "Indeed." Malcolm smiled, and a charming dent in his cheek appeared. "We will leave at once." Grant took her by the arm. She wrenched out of his grasp. "I’m not going anywhere. Not until I have my audience." She glanced around the room and saw no sign of Malcolm’s mistress. Malcolm held up his hand. "‘Tis fine, Grant. I can always make time for my lady wife." "Are you certain?" Grant’s eyes shifted from Isobel to Malcolm and back again. A wrinkle formed between his brows, and the muscle in his cheek worked as he ground his teeth together. Malcolm’s eyes met Grant’s, and something passed between the two men. Her husband gave Grant a clipped nod. "If you’ll excuse us, Grant." Grant released his breath slowly. His eyes narrowed first at Malcolm, then at Isobel. Scowling, he bowed his head. "Mackay," he said stiffly. He turned to Isobel. "Lady Mackay." Isobel watched him go then waited until the door had closed behind him. "So, where is she?" Malcolm arched a dark brow. "Where is who?" He lifted a single shoulder, as if she didn’t have a right to know. "I doona ken." Finally he said, "Your arrival was unexpected." She breathed a mirthless laugh. "I have no doubt." She expected him to look ashamed, but his expression didn’t hold even the slightest hint of remorse. She swallowed against the betrayal rising in the back of her throat and tried again. "Why are you abed?" "I’ve been ailing. Naught to fash yourself over." She approached his great bed tentatively. "Ailing how? Has your cough worsened?" He glanced down at his coverlet and then brought his gaze back to her face. "For a time, aye. I believe I’m on the mend now." His breath hitched, then he cleared his throat. "Satisfied? As you can see, I am on the mend." "Perhaps," she whispered. She ran her hand around to the back of his neck, then descended to his back. "Breathe," she said, and then reminded herself to do the same. "If you want me to leave you be, you will appease my curiosity. Breathe." "Breathe, milord." Heat spread up her neck to her face, and, to keep her free hand from shaking, she clenched a fist. The warmth of his body seeped through his nightshirt, scalding her hand not with fever but with something else. "Breathe." She struggled to force the word out. Her mouth dried, her tongue thick and heavy. She removed her hand. "You seem to have mended nicely." Even to her own ears, her voice sounded strangled. His gaze searched her face. "Aye." Isobel cradled her hand against her chest and stepped back from the bed, nearly tripping over her own feet. "I will leave you now, sir." Malcolm gave her a clipped nod. "Very well, my lady wife." "I—I will be in my chambers should you require me." He didn’t laugh, as he normally would have. "Then I shall find you there if I do. Or I will send for you." "By your leave." Her eyes locked on the floor as she dipped into a hasty curtsy and fled.